Wonder, intrigue, curiosity and discovery – qualities that are so often missing from our busy lives! Air travel was different when it first came to be. It was only for the wealthy and the elite, and often the planes were as fashionable as its passengers. Children didn’t kick the back of your seat and the cutlery was still made of silver. And the food…oh the food. It was something else. 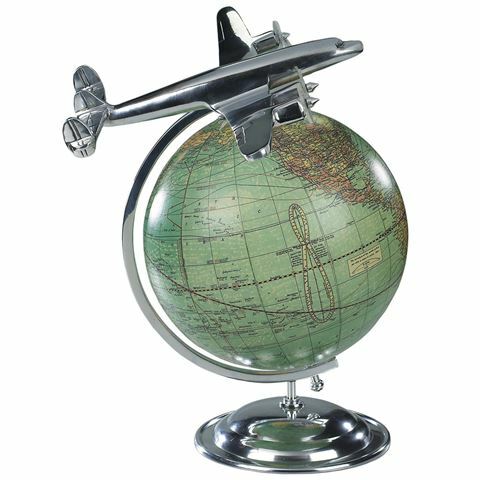 On Top of the World reflects the finer time of air travel, featuring a vintage aeroplane atop a globe of the world, replicating the feel of euphoria that the very first aeroplane passenger may have felt. Once, such a globe may have once been found in a travel agent's office. With its 1950s old-school charm and details, On Top of the World is for the aeronautical enthusiast – or just for those who appreciate the finer things in life. Hand-cast aluminium metal aeroplane and stand, with a polished finish. Replica of a 1950s travel agent's globe. Dimensions: 26.5cm (l) x 31cm (h) x 22cm (w).